How do I connect Klipfolio and Facebook? You can set up a connection between Klipfolio and your Facebook data to display your social media metrics on a dashboard. Klipfolio gets data from Facebook business pages, not Facebook personal pages. Facebook requires all business pages to be linked to an authentic personal account so you can administer the business page. To learn how to add users to a business page for administrative purposes, see the Facebook help article How do I manage roles for my Page? What options do I have for visualizing my Facebook data? Create data visualizations based on pre-built options or build your own. The choice is yours! In collaboration with industry experts and adhering to current best practices and trends, Klipfolio focuses on getting the most out of your data and presenting it in meaningful, actionable visualizations. Our pre-built content, including pre-built data sources, pre-built Klips, and pre-built dashboards can act as a complete solution or as a starting point toward custom building. Facebook pre-built data sources: Data sources provide the foundation for Klip building, so we suggest you create a data source as a first step (before building Klips and adding them to your dashboard). Our pre-built data sources focus on the most sought-after Facebook data and are found on the Service Connectors page, available from this link or from your list of data sources. When you select a service connector from this page, the data source for that service is automatically added. Facebook pre-built Klips: Pre-built Klips enable you to quickly set up a dashboard using predefined visualizations that display common key metrics. Pre-built Klips are found in the Klip Gallery or, for White Label customers, in the Integration Gallery. Facebook pre-built dashboards: Pre-built dashboards provide an efficient and effective way to gather thematically-related Klips into a single, purposeful dashboard. Pre-built dashboards are found in the Dashboard Gallery. Taking the time to learn how to create your own data sources and Klips unlocks your data and enables you to control, manipulate, and transform it, leading you to unprecedented insights into your business. Custom data sources: When you create a custom data source, you can either use the pre-built data source as a starting point from which to write your own query or you can write your own queries from the ground up and build a data source from scratch. You create custom-built data sources in the Service Connectors page, accessible from this link or from your list of data sources. Custom Klips: Using our Klip Editor, you can construct and manipulate your data, including integrating multiple data sources, to produce unique, custom-built data visualizations. You create custom Klips from either your list of Klips or your Dashboard. Regardless of whether you choose pre-built, custom-built, or a combination of both, before you start building Klips and dashboards you need to connect to Facebook data in Klipfolio. How do I connect to Facebook data in Klipfolio? When you connect your Facebook data to Klipfolio, you will be prompted to connect your Facebook account by entering your username and password. Doing so will create a token that enables Klipfolio to securely access your Facebook account. Your token looks like George@Facebook. You can use and reuse the same token every time you connect to Facebook. Note: You manage your connections (tokens) to Facebook in Klipfolio under Connected Accounts in the Account section. How do I add a Facebook pre-built data source? Navigate to the Service Connectors page in Klipfolio and choose Facebook from the list. Select a pre-built data source from the left section of the Pick a Data Request page. Click Connect an Account. Enter your Facebook login credentials and click Next. 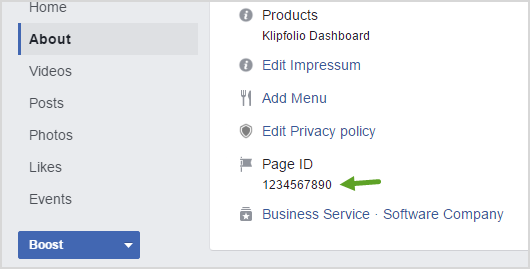 If prompted, click Allow Access to enable Klipfolio to securely access your Facebook data. Click Next Step. Select an existing connection (token) from the drop-down list and click Next Step. On the Configure Data Source page, select your Facebook Company Page from the drop-down list. Click Submit or, if you want to modify the pre-built data request, click Switch to Custom Settings. Note: If you switch back to the Basic settings page after making changes in the Custom settings page, your changes will not be saved. On the Configure Data Source page, modify the Query URL to get the data you want. You can use the existing information in the Query URL text box as a base. It was auto-filled based on the pre-built data source you selected in the Pick a Data Request page. Note: In addition to your raw data source, you can create a modelled version of your data source at this stage. To create a modelled data source, ensure that the checkbox next to Model this data source is selected before clicking Continue. To learn more about creating a modelled data source, click here. How do I add Facebook pre-built Klips? In the Klip Gallery or, for White Label customers, in the Integration Gallery you can browse individual Facebook pre-built Klips and add them to your dashboard. You replace the sample data that is included in pre-built Klips with your own Facebook data by clicking the menu in the Klip and selecting Connect your data. How do I add Facebook pre-built dashboards? In the Dashboard Gallery, you can browse pre-built dashboards that feature Facebook or include Facebook as one of the data sources. You replace the sample data that is included in pre-built dashboards with your own by clicking Connect Your Data at the top of the dashboard. How do I create a Facebook custom-built data source? If you choose to create a custom Facebook data source, you may need to enter your Facebook Page ID into a specific spot in the query. Open Facebook in a new window. Navigate to your Facebook business page. On your Facebook business page, select About. Under Page ID, copy your ID number. On the Pick a Data Request page, click Create a custom Facebook data source. Edit the Query URL to return the data you need. Refer to the Facebook API documentation for details. If you want to edit a data source that you already created, check out How to edit or reconfigure a data source, and get step-by-step instructions. How do I create a Facebook data source from scratch? If you need assistance using APIs, enlist a data analyst or developer. Use the Facebook API Explorer to build and test your queries before you use them to bring data into Klipfolio. Refer to the Facebook API documentation to discover more data requests. When you are happy with your query, click Submit, and then save and name your new data source. You're now ready to use it to build a Facebook Klip. See the reference table below for API related information and sample queries. Rate limiting in the Facebook Graph API should be encountered only in rare circumstances. Learn more about Rate Limiting on the Graph API. Note: You only have access to a Facebook company page that you manage. For more information on access to a Facebook page, see How do I manage roles for my Page? How do I create a Facebook custom Klip? You create custom Klips from either your list of Klips or your Dashboard. You choose a data visualization format, for example, a pie chart, gauge, or table, and decide whether you want to use an existing data source or create a new one. In the Klip Editor, there are limitless opportunities to modify, relate, and display your data. See the following related articles for more information and get building!